"This is really delicious on its own, but I use it mainly to serve alongside brownies, bread pudding, apple pie, berries, or poached pears. You can either make this as a thicker cream or as a sauce. I love it as a cream for berries, poached pears or brownies and as a sauce over apple pie or bread pudding. 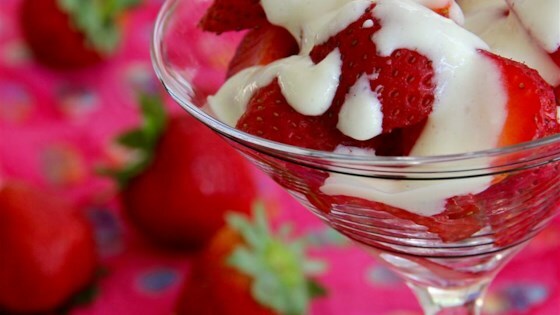 Serve chilled over warm or cool desserts or just eat it on its own as a custard." Heat 2 cups milk in a heavy saucepan over low heat until simmering, about 5 minutes. Beat remaining 1/2 cup milk and cornstarch together in a bowl using a whisk until dissolved; add sugar and egg yolks and beat until smooth. Slowly pour milk mixture into simmering milk while gently whisking the simmering milk; simmer, stirring frequently, until thickened, about 3 minutes. Remove saucepan from heat and stir vanilla extract into sauce. Pour the sauce through a wire mesh sieve into a bowl to remove any cornstarch lumps. Place a piece of plastic wrap on top of the sauce, ensuring the plastic wrap is touching the sauce to prevent a skin from forming; cool to room temperature, about 20 minutes. Move sauce to refrigerator and chill completely cold, at least 30 minutes. Use 2 tablespoons cornstarch for a creamy texture and 1 tablespoon cornstarch for a saucy texture. If you wanted to make the sauce but your mixture is too thick, just stir in some room temperature milk or half-and-half, a little at a time, until you have the consistency you like. This recipe is tailored to medium sweetness. If you like things sweeter you can increase the sugar to 1/2 cup. You can also use a vanilla bean instead of the extract. If you do that, split the bean lengthwise and put it right in the 2 cups of milk before you start heating the saucepan. When the milk is simmering, fish out the bean, scrape the vanilla seeds into the saucepan and discard the bean itself. Whisk the milk/sugar/yolks/starch mixture in at this stage. Many people prefer the more sophisticated flavor of a vanilla bean over extract, but extract turns out delicious and everyone has that in the pantry. If you're serving this alongside another dessert, plan for a couple of tablespoons per serving. You should have enough for at least 6. Very good! Made exactly as written and my family loved it. You do need to strain it to get all the chunks out but it was creamy, simple and delicious! The next time I make this I will definitely use more cornstarch, 2Tbsp. was not enough to suit me, it was too thin. I will also amp up the flavor with extra vanilla.